This is the main ballroom at Flowerfield Celebrations in St. James, NY. Located just 15 minutes from my Suffolk County, NY studio Flowerfield offers one of the most amazing wedding experiences anywhere. I have created awesome wedding pictures here on dozens of occasions over the last twenty years yet I’m always impressed by this place. Elsewhere on this web site you will find other pictures from this establishment. The unique cocktail hour room...a huge greenhouse kind of room featuring a beautiful bridge spanning an indoor Koi pond. Pictures of that same room decorated for the Christmas holiday season. Pictures taken on the impeccably manicured grounds with their ponds, fountains and it’s own island where outdoor wedding ceremonies are hosted. You will also find pictures of their sister-establishment, Land’s End Caterers in Sayville, New York. One of the things that always impresses me about this place is that this room never looks quite the same twice. It takes on a whole different and unique appearance based upon how the bride and groom choose to decorate it. 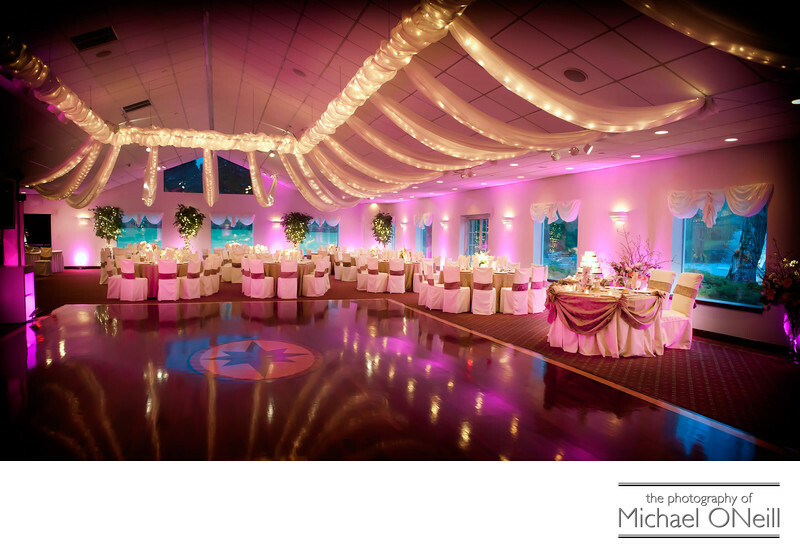 Flowers, floral centerpieces, uplighting, linens, chair covers, etc all come into their own when arranged in this incredible ballroom.